Custom tool boxes and kits from ePromos work well in the home, office and while traveling. No matter where your customers, clients or employees work or play, our personalized tool boxes do wonders for increasing brand awareness. Unlike other corporate gifts, tool sets are a helpful gift to receive in every season. Designing your own kit is easy with help from our promotional experts. Create the perfect branded giveaway for your next trade show, conference, or business function with ePromos! Your clients will surely appreciate these functional and handy gifts that show that you truly care for your client’s needs. 6-Bit promo screwdriver set with 3 Philips bits and 3 flathead bits stored in a swivel out compartment. Promotional Screwdriver Set - 4 pcs. You won't have any screws loose with this promotional screwdriver set around! With 4 included bits, you'll be ready to tighten anything that comes your way. 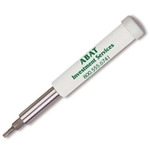 This custom screwdriver set is precisely what you need to tackle those tough, fine detail jobs. A handy promo screwdriver kit with various sizes of flat head and Philips head bits and a bright LED light. A 15 piece executive custom tool kit packaged in a striking zippered nylon gauge case. A 12 piece executive custom tool kit packaged in a 600D polyester case that will certainly come in handy around the house or on the go! Six tools in one practical custom screwdriver. This custom tool bag is an elegant way to ensure your logo goes where they go. Multi-functional promo screwdriver that fits in their pocket. Pocket sized promotional glasses repair kit packed in promotional clear plastic case. Logo first aid kit includes essentials to aid in an emergency. ePromos carries tool-related gifts that are the driving force to successful promotions: multi-function keychain tools, heavy-duty tool bags, glasses repair kits, small tool kit gifts and more! Tools are important promotional items, allowing us to accomplish tasks whether around the house, at the office, or in the car. You’ll find the ideal marketing tool at ePromos. We stock combination flashlights and tool sets, household tool kits, auto emergency sets, and even a tool bag that contains 196 useful pieces. Custom logo tool sets make excellent giveaways for industries such as engineering, construction, architecture, mechanical, carpentry, electrical and many more -- including the at-home handyman and true gadget lovers. Tools have a higher perceived value than many promotional giveaways, and recipients tend to keep these types of gifts longer. When these tools are needed for small emergencies or during an unfortunate breakdown or repair, your customers will have what they need and your name will be attached to the solution…that’s great marketing! And when ePromos carries brand names including Canyon Outback and Carhartt, you know we care about quality. Of course, we also have a wide variety of styles with varied functions, at prices that will fit anyone’s needs and promotional budget. For your logo, you have a variety of decoration methods from which to choose: including screen printing, pad printing, laser engraving, embroidery, debossing and four-color printing. ePromos can even print your logo within an epoxy color dome on some of our products. ePromos offers the lowest price match guarantee, 24-hour rush is available on many products, and your satisfaction is 110% guaranteed! Browse our selection of personalized tool boxes and kits, or call an ePromos Brand Consultant for any assistance you may need. We’re happy to help you find the perfect promotional products for your business or organization!